In an important test of ICANN’s primary accountability mechanism, its Independent Review Process (IRP), the organization has been handed a stinging blow over its mishandling of the bid for the new generic Top-Level Domain (gTLD) .AFRICA. At the crux of the issue are two competing applications for the .AFRICA new gTLD and the decision by ICANN’s Board to abdicate its responsibility to ensure that ICANN’s evaluation and subsequent rewarding of the domain was carried out fairly, transparently, and in accordance with the organization’s Bylaws, Articles of Organization, and established policies. 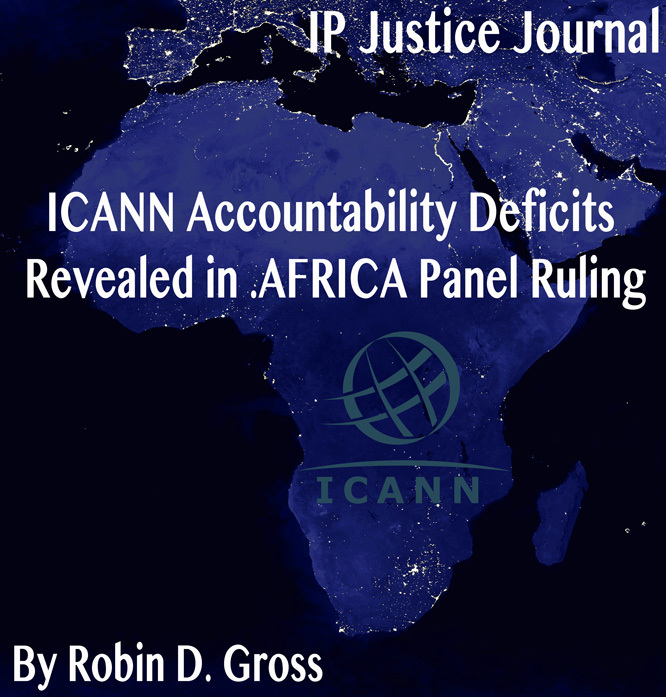 The unanimous IRP Panel of 3 distinguished adjudicators declared that both the actions and inactions of ICANN’s Board with respect to the application of DotConnect Africa Trust for the .AFRICA gTLD were inconsistent with ICANN’s Articles of Incorporation and Bylaws. The Panel found that both ICANN’s Board, and its constituent body, the GAC, breached their obligations to act transparently and in conformity with procedures that ensured fairness. As a result, the Panel recommended that ICANN continue to refrain from delegating the .AFRICA gTLD and permit DCA Trust’s application to proceed through the remainder of the new gTLD application process. Although the award did not include reimbursing DCA Trust’s legal fees and expenses, ICANN was found to be liable for bearing all the costs of the IRP and the totality of the costs of the IRP provider, more than U.S. $400,000. Several days after the Panel’s unanimous declaration, the ICANN Board of Directors met on 16 July 2015 and decided to accept the Panel’s finding and place DCA Trust’s application back in the evaluation process. Given the growing pressure on ICANN to accept meaningful accountability reform, including an independent IRP that is truly capable of correcting the organization’s mistakes, the Board had little choice but to accept the Panel’s recommendation. The Panel noted that the IRP is the only independent third-party process that allows review of board actions to ensure their consistency with the Articles of Incorporation and Bylaws. Furthermore ICANN requires all new gTLD applicants to relinquish all their rights to seek redress against ICANN in courts of law for any harm caused by ICANN or any misconduct by ICANN. Accountability requires that an organization explain or give reasons for its activities, accept responsibility for them, and disclose the results in a transparent manner. Not only did ICANN fail to provide a rationale for denying DCA Trust’s application, it did not even require that a reason be provided before killing the application that ICANN was paid $185,000 to evaluate fairly. Neither principles of equity nor ICANN’s corporate Bylaws and Articles would allow that decision to stand unchallenged. After ICANN’s Governmental Advisory Committee (GAC) issued “consensus advice” objecting to DCA Trust’s application, ICANN’s Board summarily awarded the .AFRICA domain to the African Union Commission, DCA Trust’s competitor. When DCA Trust filed for a reconsideration of that Board decision based on irregularities and non-transparency of the GAC decision making process and also based on allegations of staff misconduct discriminating against DCA Trust, the reconsideration request was also dismissed out of hand by ICANN’s Board. However ICANN’s Bylaws require the organization’s Board and its internal constituent bodies to operate to the maximum extent feasible in an open and transparent manner and consistent with procedures designed to ensure fairness. Due diligence required a conversation with the GAC about its objection, even where the advice was consensus advice. But ICANN’s Board was found to give undue deference to the GAC objection and failed to investigate the basis for the decision, even though it is consensus advice. This IRP declaration is important because it implies the board can no longer passively accept GAC consensus advice to object to a new gTLD application (or anything else) without conducting adequate diligence into the decision making process and exercising independent judgment of its own. 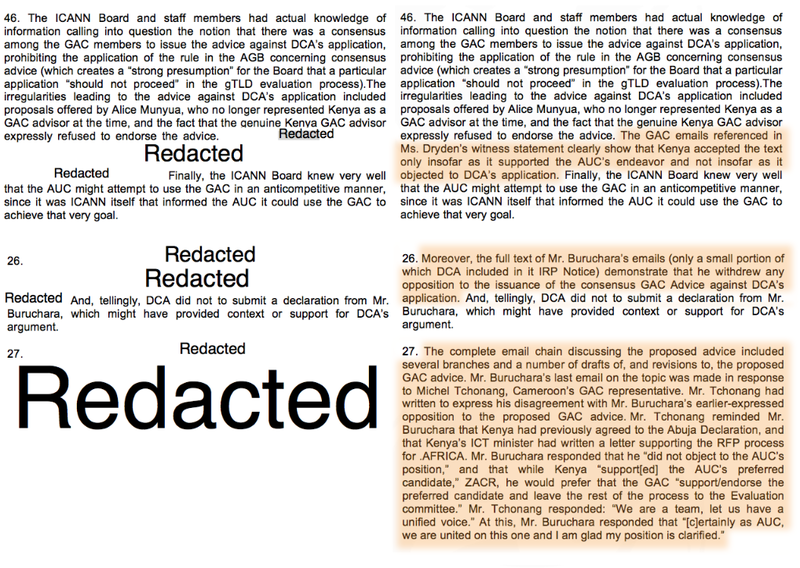 ICANN’s Board cannot hide behind murky “GAC objections” to block applications given the Board’s affirmative duties of due diligence and fairness in carrying out its activities. What this ruling reveals is that GAC has been granted too much autonomy in ICANN’s decision making process given the Board’s ultimate responsibility for GAC as a “constituent body” of ICANN. But ICANN’s Board has no involvement in, much less control over, whether the GAC grants to any party voting membership status; that decision remains within the sole discretion of the GAC. Thus, although the Board is legally responsible for the decisions, GAC holds a growing power over those decisions, but bears no legal responsibility for them. ICANN’s board failed to conduct due diligence and investigate if the organization’s constituent bodies, the GAC in particular, were operating in a manner of openness, transparency, and fairness. Because the board did not investigate allegations of inappropriate staff conduct after being put on notice of discriminatory actions, it was found to have violated the organization’s Bylaws’ obligation to exercise appropriate care and diligence in carrying out its duties and activities. By failing to apply ICANN procedures in a neutral and objective manner with procedural fairness, ICANN breached its Articles and Bylaws. The Guidebook lists three specific reasons why GAC could issue a consensus objection to a gTLD application, yet upon investigation, the IRP Panel uncovered that GAC is not constrained in any manner, and in operation, it can object to a domain name application for any reason or for no reason at all. The Panel noted that GAC’s own witness, its former Chair, Heather Dryden, admitted during the IRP hearing that GAC did not act with transparency nor in a manner designed to ensure fairness. Ms. Dryden also stated that the GAC made its decision without providing any rationale and primarily based on politics rather than on potential violations of national laws and sensitivities. Indeed she testified that GAC is not required to provide any rationale with its consensus objections. So, basically you’re telling us that the GAC take a decision to object to an applicant, and no reasons, no rationale, no discussion of the concepts that are in the rules? But you are also want to check to see if the countries are following the right – following the rules, if there are reasons for rejecting this or it falls within the three things that my colleague’s talking about. So you don’t go into the reasons at all with them? To the issue of consensus objection, no. Thus ICANN Board was legally required to conduct a meaningful review of its previous decision to accept the GAC objection advice and it did not. The Panel declared, “[I]n light of the clear ‘Transparency’ obligation provisions found in ICANN’s Bylaws, the Panel would have expected the ICANN Board to, at a minimum, investigate the matter further before rejecting DCA Trust’s application.” The Panel said it would have had a similar expectation with respect to the Board’s response to the GAC consensus objection. Instead of investigating the conflict or providing a meaningful reconsideration of its prior decision, the Board simply accepted the GAC objection as if it were definitive on the matter, rather than an input to consider. The law does not allow ICANN’s Board to abdicate its responsibility to govern ICANN to the GAC; nor may it violate its Bylaws’ obligations to conduct ICANN’s affairs with fairness and transparency, simply because GAC desires a specific policy objective. ICANN’s claim that “the Guidebook explicitly states that Early Warnings may be issued for any reason” did not hold much sway with the Panel, which declared that ICANN must follow rules, notably its Bylaws and Articles, which require transparency and fairness in the administration of its duties. At the 16 July special Board meeting, ICANN’s Board stated it would ask the GAC if it wishes to refine its consensus advice to object to DCA Trust’s application, provide further information regarding that advice, or otherwise address the concerns raised in the Panel’s declaration regarding GAC. The continued development and impact of GAC advice on ICANN’s decision-making process is particularly worth watching going forward. The Panel noted a number of times throughout the lengthy IRP process when ICANN staff attempted to reduce the ability of the Panel to provide meaningful accountability. Just as ICANN’s Cross Community Working Group on Accountability begins to examine “ICANN staff accountability” in the overall accountability framework of the organization, the Panel’s declaration is all too illuminating on the significant hurdles one must traverse when trying to hold ICANN accountable for its actions. At every turn, ICANN staff, particularly its lawyers, attempted to erect barriers in the process that would insulate the organization from responsibility and render the IRP impotent. ICANN claimed the Panel could not examine witnesses. The Panel decided otherwise and noted that both ICANN’s Bylaws and the Supplementary Rules require an IRP Panel to examine and decide whether the board has acted consistently with it obligations. Without the ability to examine witnesses and test the veracity of their claims, the Panel would be unable to ensure that the parties to an IRP are treated with equity and given a fair opportunity to present their case. ICANN claimed the Panel could not suggest a remedy if violations were found. The Panel disagreed with ICANN’s claim because if the IRP mechanism is intended to provide a remedy for a claimant materially injured or harmed by Board action or inaction, then naturally the IRP Panel may recommend how the ICANN Board might fashion a remedy to redress such injury or harm. ICANN claimed the Panel’s standard of review was to be “deferential” to the board of directors, rather than a de novo standard, which is an objective and independent one, examining whether the Board acted or failed to act in a manner inconsistent with ICANN’s Articles or Bylaws. The Panel declared that the IRP was specifically designed and set up to offer the Internet community, a de novo standard of review that would ensure that ICANN acted in a manner consistent with its Articles and Bylaws. ICANN claimed that an IRP was not permitted to address whether the GAC did anything inappropriate and could only consider Board actions or inactions. The Panel, however, noted that GAC was clearly a constituent body of ICANN and was therefore required to act transparently and in a neutral and objective manner and that it was empowered to examine that conduct. 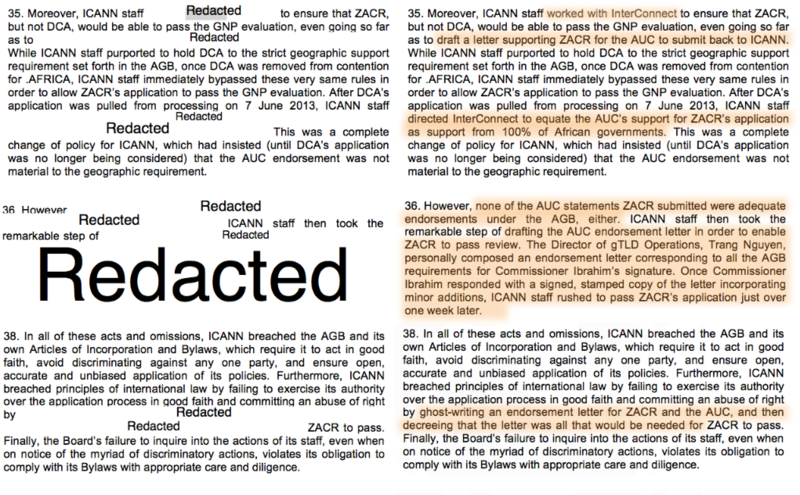 Astonishingly, before publishing the Panel’s declaration, ICANN redacted key text from the declaration in at least 39 separate places to further hide its misdeeds. 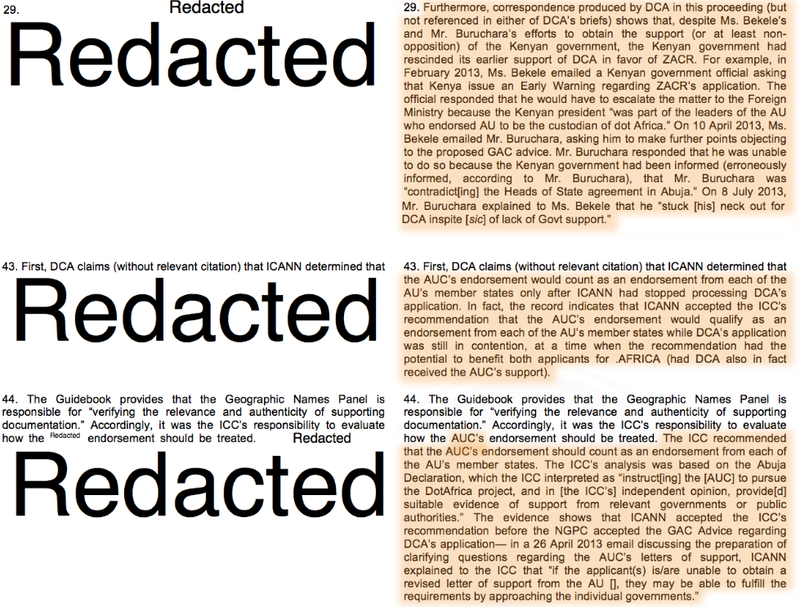 According to sources who have seen the un-redacted ruling, the deleted text primarily discusses specific instances of ICANN staff misconduct including ICANN’s senior management’s drafting of the letter which it then relied upon to provide the winning bid for .AFRICA to DCA Trust’s competitor. There appear to be redactions also of the GAC former chair’s testimony explaining how “the political process” at ICANN works. Clearly it is inappropriate for ICANN to abuse its position in the publication of the IRP declaration to censor instances of ICANN staff misconduct and GAC unaccountability from public view. As the redacted declaration is already significantly damning with respect to revealing ICANN accountability failures, it begs the question as to just how much more unflattering the redacted text must be. Even after ICANN was severely rebuked by the Panel in its ruling for its many instances of inappropriate conduct in this matter, ICANN continued with its usual practice of hiding the extent of its misconduct from the public it allegedly serves. A new culture of transparency in every aspect of key decisions must take root at ICANN before the organization can be given any greater responsibility to serve the public, rather than not itself. This ruling is significant in many respects, including demonstrating the absolute necessity of having an IRP that is truly independent of ICANN’s Board and staff. Managing the Internet’s domain name system requires a level of competence and trustworthiness to the public interest that ICANN has not yet shown itself mature enough to undertake without an independent adjudicator of ICANN’s actions. This ruling could also have important precedential value for the many other new gTLDs, which have also been negatively impacted by GAC advice or objections that may not comport with ICANN’s legal obligations to follow rules in a fair, transparent, and objective manner after conducting due diligence. The “presumption” that GAC consensus objections to new domains shall be obeyed by ICANN’s Board has been solidly overturned by the Panel since neither the Board, nor the GAC itself have required the GAC to follow rules or process, to operate fairly, or even state reasons to objections that can be addressed. Furthermore, the Board may not abdicate its responsibility and hide behind GAC decisions without undertaking its own independent inquiry and exercising its own judgment as to whether proper process and appropriate decisions were taken. 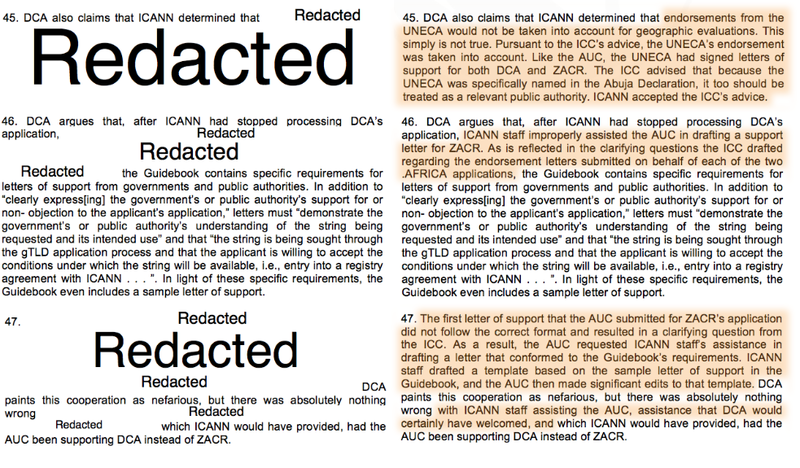 The light shown on the non-transparent and lawless nature of ICANN’s GAC calls the actions and structure of the entire organization into question. ICANN cannot promise the world transparency, fairness, due diligence, and objectivity in its exercise of these important responsibilities at the same time that it does not require those qualities of its constituent bodies, including GAC, the Board, and ICANN’s staff. Another important consideration from this ruling is the tremendous cost and time that one must invest to try to hold ICANN accountable. DCA Trust could have easily spent a million dollars to bring this action to completion in lawyers’ fees, panelists’ fees, and other expenses. New gTLD applicants are required to waive all their rights to legal enforcement by courts of law, so the IRP is the only independent mechanism available to those harmed by ICANN, and one must be prepared to spend millions of U.S. Dollars in order to have their rights enforced. Not exactly a mechanism that is accessible for 99% of the world’s population, despite ICANN’s global impact and claim of public service. In any event, the .AFRICA is among the most important and precedential IRP declarations ICANN has ever received.